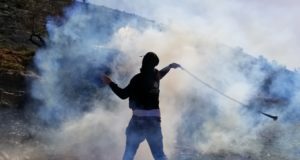 Today, Palestinians are facing an enormous amount of pressure in their lives due to the growing violence of Israeli forces. 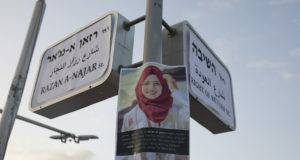 Israeli politicians have fueled the motivation to kill Palestinians by making open statements encouraging Israeli citizens to become executioners. Since the beginning of October, Israeli occupation forces have started to exceed their abuse of power by carrying out a series of extrajudicial killings of Palestinians, in a manner that is completely unjustified and, in most cases, constituting crimes of war. In addition, Israeli forces are applying measures of collective punishment towards the families of Palestinians who are killed in this unlawful manner. In many cases, the army does not return their bodies to their families, preventing them from carrying out their funerals. Furthermore, Israel has been demolishing the houses of these families, leaving many people homeless. When you come to Palestine, there are many things you can do. 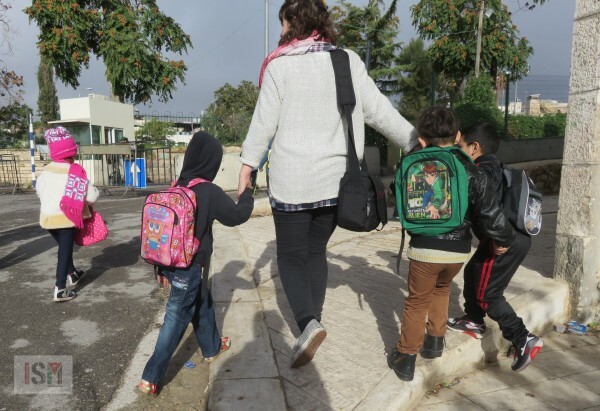 In Al-Khalil (Hebron), we need volunteers to continue walking children to school and monitor the three checkpoints were the children cross two times a day, on their way to school and back home. Our presence there is crucial because we witness and document what we see and can show the world what is happening on the ground. We do our best to prevent Palestinians from being harassed, and more importantly, to show them we are there in solidarity with them. In Jerusalem, you will document human rights violations and report them in the media. You will be present in checkpoints such as Qalandya, the Shufat Refugee Camp, and nearby villages. You will monitor violence from settlers and police in the old city during the day, and the monthly settler march were settlers roam in the streets of the old city at night. During these marches, Palestinians are forced to close their shops and face the danger of being attacked. In the area of Jerusalem, you will also monitor schools and hospitals. In addition, there are many child arrests that need to be covered in the media, where you will visit the families and write their stories. In Jerusalem there are also many home demolitions and evacuations that you will need to document and report in the media. In Tulkarem, which has recently seen regular violent attacks from the Israeli army towards university students inside the campus while they are studying and attending exams, we need volunteers on the ground to continue documenting these crimes of war and create awareness on the situation. Watch video of army’s incursion here. Furthermore, in Tulkarem, the army is threatening to permanently close gate 623 that gives access to farmers to their land, in other words, to their sustenance for living. This gate needs international human rights defenders to monitor on a daily basis from 7:00 to 8:00 in the morning. In Nablus, several houses have been demolished since October. We need to continue being present and reporting on these human rights violations when they arise. You will visit the families who suffer from being left homeless, and write their stories. In the city of Ramallah we receive calls from prisoners’ families to attend military court hearings, in the Ofer military prison. We believe that being present in these hearings can put pressure on the Israeli authorities and decrease their abuse of power when giving sentences to Palestinian political prisoners. Moreover, all throughout the West Bank, in cities and villages, the popular committees organize regular demonstrations were the ISM is called to participate. As ISM is a Palestinian led movement all our actions are initiated on invitations from or initiative of Palestinians following their lead and wishes. 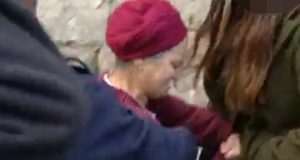 When you come to Palestine, try to bring your computer with you and a camera, as you will need it for the media work. To plan your trip to the West Bank, please read our traveling information. We ask our volunteers to commit for a minimum of two weeks after completing our two day training, but keep in mind that we always prefer to have volunteers stay for longer periods of time. When you decide to come to Palestine to join us, or if you have any further questions, please write us to palreports@gmail.com. 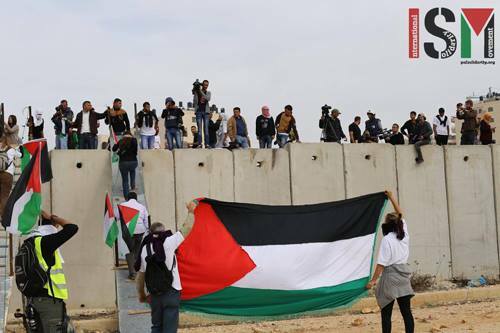 ISM volunteers raising Palestinian flag in front of the Apartheid wall.